I have several adult friends who ADORE the Minions as much or more than their children! So, for any of you out there who love the Minions AND enjoy a nice, warm, relaxing bath, here is a recipe for Minions Bath Scrub that you can easily make at home. It’s a fun activity you could let older children help you make – also an interactive Home Economics/Consumer Sciences home school activity! At just 5 ingredients, that you can buy in bulk to save money and stretch, it’s also super affordable, and would make a fabulous Homemade DIY Gift for a Minions fan on your holiday gift list! I have several friends who’ve been encouraging me to try out coconut oil, sharing how great it can be to give your skin a nice little boost. I’ve included links to each product at Amazon (Disclosure: I’m an affiliate, they pay a few cents if you make a purchase after clicking a link), so you can easily find each ingredient, see an example of what the packages/brands look like, etc. Of course, you can use any brand of your choice, these are just affordable examples I found. 2 C Epsom salt – Amazon has a 1 lb. package, currently starting at just $1.99! -Combine the Epsom salt and coconut oil. Stir until mixed. -Add 5+ drops of Lemon essential oil. -Divide the Epsom salt and oil combination into 2 bowls. -Mix the yellow gel food coloring with the Epsom salt mixture until the color is thoroughly blended. -Add the Lemon essential oil to the yellow Espsom salt. -Mix the blue gel food coloring with the Epsom salt mixture until the color is thoroughly blended. -Layer your prepared scrub with the blue on the bottom topping it off with the yellow. 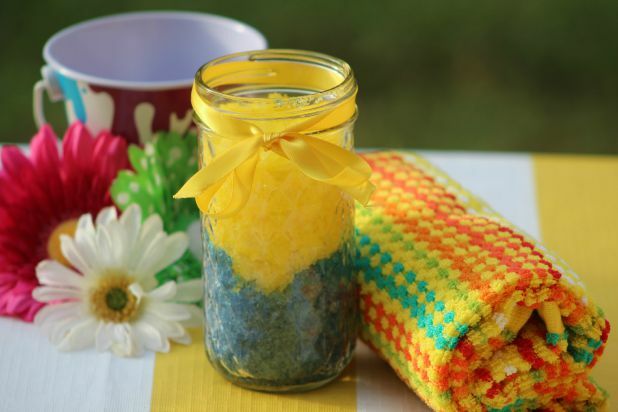 -Tie a yellow ribbon around the top of your bath scrub jar. – Keep close to your bathtub to use when you bath. Wonderful, creative, DIYer project to do for the Despicable M3 this summer. Great for kids and adult fans. very cool idea, this would be super fun to make. We love the Minions and the movies. This is a great gift idea for my granddaughter. Love the list too! My daughter agrees that this would be a cute idea for her Cub Scouts to do for Christmas gifts later this year. 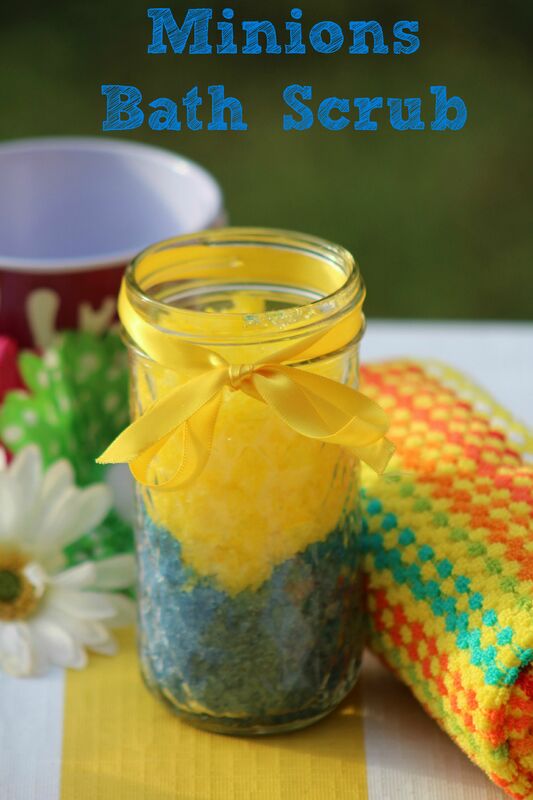 I love the fun colors of this scrub, of course from the minions (those loveable things) theme! I could use a nice scrub. Really cute idea. Bright colors! Love it! What a great homemade gift idea for the holidays! Sounds like a lovely bathing experience! This would be such an easy and fun projects for kids to make for gifts. They would love it! I CAN’T WAIT TO TRY THIS! THIS WOULD ALSO MAKE A GREAT GIFT! PINNED IT! Does the yellow batch get twice as much lemon EO? This would be great for my middle gradchild. She loves the Minions and she could help me make it. I’ve never tried coconut oil before nor have I ever made my own bath scrub. This would take care of both. I’m not a fan and could never have children so I will pass along. What a cute idea. Sounds like it would make a perfect gift or party favor. This is nice. Very creative. The yellow ribbon really sets it off – these would be great party favors at a kids birthday party too! My grandson would have fun helping me make this. Thanks for the idea! Good idea for presents and easy to make. Super fun!! i love the minions just as much as my son!! They are so super cute!! This scrub is so easy and cute!! This is really cute! I have never tried to make my own bath scrub before. Seems like fun! I love the Minions & I love homemade bath scrubs, so thanks for this! It’s really cute. What a fun gift idea and thank you for sharing this with us! Pinning for later. MY GRANDDAUGHTER WOULD LOVE THIS. SHE’S A MINON FANATIC. My sister is crazy about the Minions, I’ll have to make this for her for a Christmas present. Thanks for sharing! What a simple gift idea! I Love that it is so easy to do. The colors are great. This would be fun for the kids to join in and make! Thanks for sharing! I like that it uses just a few ingredients and they are things easy to get. Cute idea. Thanks for the list of party favors. A great way to really add a special touch to a Minion movie night. Such a cute idea and would make great Christmas gifts and stocking stuffers. These are so cute, I will definitely be making a few jars for friends for stocking stuffers! Thanks for the links about the food coloring and where to buy. This is a really neat idea! I’d like to play around with different colors too! I bet you can treat it kinda like sand art and make neat designs too! Cute idea, and I always liked blue and yellow together, even before the Minions. Cute idea for a minions gift or with those colors for spring and Easter. Bath salts are easy to make and make great gifts. Sounds like a great activity to share with my niece. She loves scrubs and minions! oh goodie you know anything minions will be a hit, I love crafting gifts this is a must do! Cute idea and so popular right now. Beautiful colors and pretty easy to do! Thanks for sharing! Who doesn’t love the minions this would be great to include in a gift basket. How fun is this and thank you for sharing! I’ve never tried making my own bath scrub before and this looks easy enough even I could do it! I’m looking forward to trying it. Thanks for sharing. This is adorable and such a creative idea. I love it.